So, if you haven't seen it yet, on my home page, near the very bottom, I ask my readers two questions. What language(s) are you learning right now? What is the hardest part about learning a new language? I'm getting some good answers. One reader said that consistency was the hardest part about learning a language. 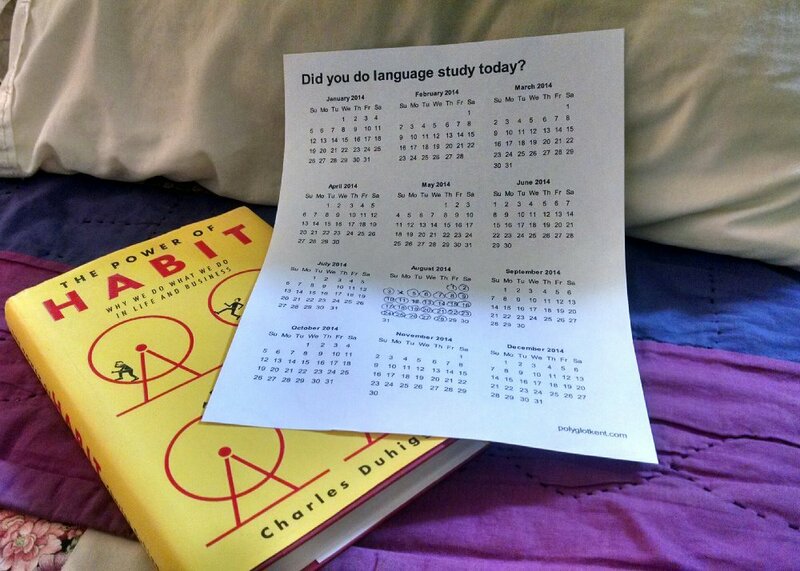 My Language learning calendar and a book about habits. So, most of us have been there. We get excited about learning Spanish or French or some other language. We buy a book, or heaven forbid, some overpriced software. We imagine ourselves sitting outside a cafe in Paris, reading the Le Monde newspaper with the Eiffel Tower behind our back and the cool Parisian breeze in our face. We study hard for a few days. Maybe even two weeks. And then life gets in the way. We don't consciously forget our goal of being fluent in another language. In fact, we still tell ourselves we are going to become fluent someday in German or Japanese or something more exotic like Bislama or Walof. We even start again three months later or possibly three years later. This time, we tell ourselves, we are going to be better at studying. We're really going to learn Italian, this time. Not like last time, or the time before that. Consistency is the key; habits are the answer. Before I really got serious about learning languages, this happened to me all the time. The number of languages I've started to learn but quit after a week or so is much bigger than the number of languages I can speak. Ancient Greek, Iu Mien, Hebrew, Swedish, Norwegian, Portuguese, Korean, Piedmontese, Bislama, Tagalog and probably several I've forgotten about are on my list of languages I've started to study, but never ever learned. Iu Mien was one I actually spent over a month on. While learning it, I made a decision that if I only learned 10 words a day (and retained the words that I learned previously) I could have a pretty large vocabulary in less than a year and be able to say most of what I'd want to say in Iu Mien. That lasted over a month. Then my life suddenly became super busy, I stopped studying Iu Mien, and six years later I can only remember about twenty words. What is a habit? A habit is something you do over and over again, without thinking about it. We often think of habits being bad, like smoking or biting your fingernails, but habits can be good or bad. Habits usually start as a conscious decision. I have a habit of using my turn signal on my car when I want to change lanes. When I was learning how to drive, using my turn signal was something I had to think about. Years later, it is something I do without realizing I'm doing it. To effectively create good habits we need to understand the anatomy of a habit. Most of us, when we think of a habit, think of the action part of a habit, but that's not the whole habit. A habit has three parts: a trigger, an action, and a reward. Let's say you had a nasty habit of picking your nose. The trigger is the sensation of a plugged up nose. The action is picking your nose. The reward is being able to breath through your nose again. The reward is important. If you didn't have a reward for picking your nose, you wouldn't pick it. The trigger is also important. If you never had boogers in your nose, you'd never pick it. A couple of years ago I decided I wanted to develop the habit of making my bed every single day. I picked a trigger: seeing an unmade bed. I had to figure out a reward. This was a little trickier. The reward I picked was that after I made my bed, I would look at it for a couple of seconds, and let myself feel like I've accomplished something. Some days I would forget in the morning. Since the habit was important to me I'd sometimes make my bed at night right before going to bed. It might seem a little silly to make a bed two minutes before you mess it up again by crawling inside, but I wanted the habit of making my bed everyday. So every once in a while for the first week or two, I'd make my bed at 9:45 at night, look at it for a few seconds, let myself feel like I've accomplished something, and then go to bed. It eventually became a habit, and it gave me the confidence that I could build other good habits. You can, too. Remember that habits have three parts: a trigger, an action, and a reward. If you have a bad habit, it's much easier to change that habit, than to erase that habit. For many of our habits, we can't avoid the trigger, and that makes it harder to avoid the action. So what we do is we keep the same trigger, the same reward, but change the middle part. For example, let's say you have the habit of checking Facebook on your phone when you are bored. Not the worst habit you could have, but it can be a real waste of time. The trigger is boredom. The action is checking Facebook on your phone. The reward is relief from boredom. Let's say you want to stop doing that, and do something more productive with your time. You probably have the Facebook App icon in a specific place on your phone. Move that icon somewhere else, and in it's place put the icon for Duolingo or Anki or some other language learning app. Now, next time you are sitting in a waiting room at the doctors office, or waiting in line at the Department of Motor Vehicles, you're going to reach for your phone without even thinking about it. You are going to swipe to where the Facebook App icon is, but the Duolingo App button is going to be there instead. Here, at least for the first couple of times, you're going to make the conscious decision to use Duolingo instead of Facebook, but your going to feel good about your choice, and relief from boredom reward is still there. After a couple of weeks, the lazy part of you is going to remember where you put that Facebook icon. That's okay, just switch it to another place again, and put a language learning app icon in its place. Our goal is to become consistent language learners. We want to study a language every day. Just like my bed-making habit, sometimes we forget. So we need a trigger we are going to see before we go to bed, that will remind us to study a language. When I was learning to make my bed everyday, that trigger was easy. I would see an unmade bed at bedtime, if I had forgotten to make the bed in the morning. My suggestion for making language learning a habit, leave a calendar on your pillow. I prefer a one page calendar that has the whole year on it, like this one. If you study a language that day, put a circle around the day. Put an 'x' on days you forgot. Let's say you get home late one night, you see your calendar, and you realize that you forgot your language study that day. But you're super tired and just want to go to bed. Remember, our goal is to become consistent language learners. At this point, maintaining the habit is more important than the quality of your study. Pick something to study for five minutes. Read something in French or review some vocabulary you learned earlier in the week. The key is to keep the habit going, because if you don't study today, it's going to be easier to not study tomorrow. There's tons more information about how good habits are formed and why we have habits in the book The Power of Habit, by Charles Duhigg. This is one of the best books I've ever read. It might seem weird to see a non-language-learning book endorsed on a language-learning blog, but this book has helped me become less lazy. And lazy and language learning don't mix. Has anything helped you become a more consistent language learner? Let us all know in the comments. And pretty please, help me make this site more useful for you. Answering the two questions at the bottom of my home page will help me make sure I'm creating relevant content for my readers. Thanks! Oh I have to read this book - it's been on my to-read-list for a while. I'm totally convinced that habits influence most of our daily life and that's possible to manipulate habits in a positive way. Although I have to say, it's not as simple as it sounds. I try to get rid of a few habits (and are not particularly language learning related) but it's though. I'm really looking forward to reading the book! Thanks for your articles and your tips! It's a great book. I've read it twice and enjoyed it both times. My only criticism of the book is that the author does a great job explaining why we have habits, it isn't until the end of the book (when he explains how he stopped his cookie-eating habit) that it gets into practical advice. You're right! habit is important to learn something. But I got easily bored after few weeks doing it. I don't get much fun thing after. How to make it fun? For me, the key to avoiding boredom is variety. When I'm learning a new language I don't just use one resource. I'll use a book for a little bit. Then I'll use a phone app like Anki or Duolingo. Or I might find something on YouTube. Using different ways of studying and practicing a language will help you have more fun with language learning. I've tried to change language on my facebook page, also change on my cell phone. Youtube is fun too, its fun to watch some actress or footballer interview in their language. I haven't changed my language on my cell phone yet, but I have changed my Facebook language several times. Facebook doesn't have the Lao language available, so I still have it set to Esperanto from a couple of months ago. I don't think it's ever occurred to me to try changing a bad habit into a better one instead of just fighting with the bad habit - that's a really good idea!